The Olympic Queen mattress is an obsolete mattress size, 66" wide by 80" long. The normal Queen size mattress is only 60" wide and 80" long. So, obviously, the length is the same but the Olympic Queen dimensions are six inches wider. Six inches may not seem like a lot to you, but Olympic Queen sleepers will tell you, size matters when it comes to mattresses, even six inches. The extra width is GREAT! Up until now, if you owned the rare and mostly obsolete Olympic Queen mattress, getting a replacement was either impossible or a very expensive special order ordeal. Our BETTER mattress is our beginner pillow-top/firm model. It is designed around a 13.5 gauge 390 coil spring set with molded spring protection on both sides of the coils. Followed by cotton pad protection, and a layer of bonded cotton. The needle-punched cotton pad lies under a half-inch layer of comfort foam. Next the pillow-top is created from a layer of quilted cotton and a 1.5-inch layer of soft comfort foam. Finally the fine damask cover is quilted to create a great beginner pillow-top/firm mattress.. This BETTER mattress incorporates our amazing plush feel on one side and firmer feel on the other side. Want a different feel? Just flip the mattress. An idea whose time has come, especially when you consider the poor value that a one sided "no flip" mattress offers. 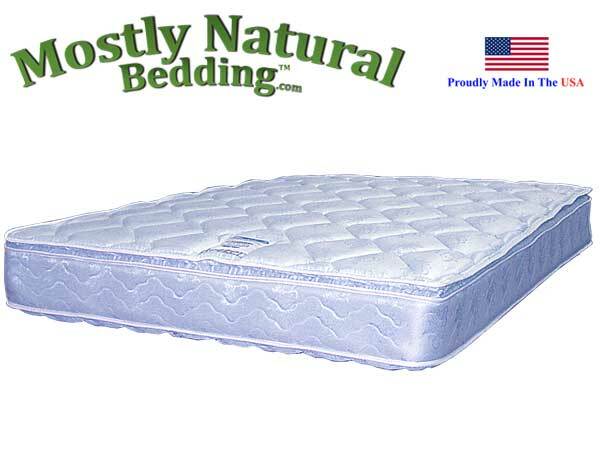 Our BETTER model sold here offers low price with plush pillowtop but supportive feel and a firmer feel with tighter quilting on the other side. Coil count is approximately 390 Coils. 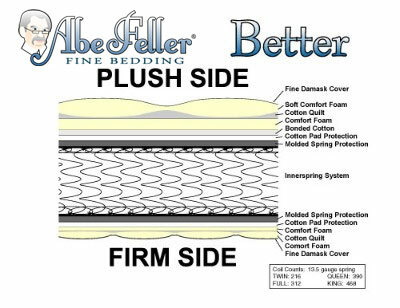 Expanded Queen Replacement Mattress Abe Feller® BETTER. Measures 66" wide by 80" long.